Hello Skip to My Lou readers! I’m Jen from Tatertots & Jello and I am so excited to be here. 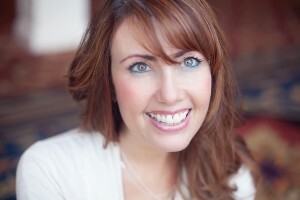 I love Cindy’s Teacher Appreciation series each year and it’s such an honor to participate!! I think it’s always fun to give teachers a gift that they can use during the summer on their time off. We love smoothies and I thought it would be great to use a play on words with juice and a gift certificate to a juice bar. 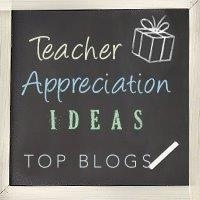 Thanks for letting me stop by and share my teacher appreciation printable!! I have loved seeing all of the AMAZING ideas so far!! 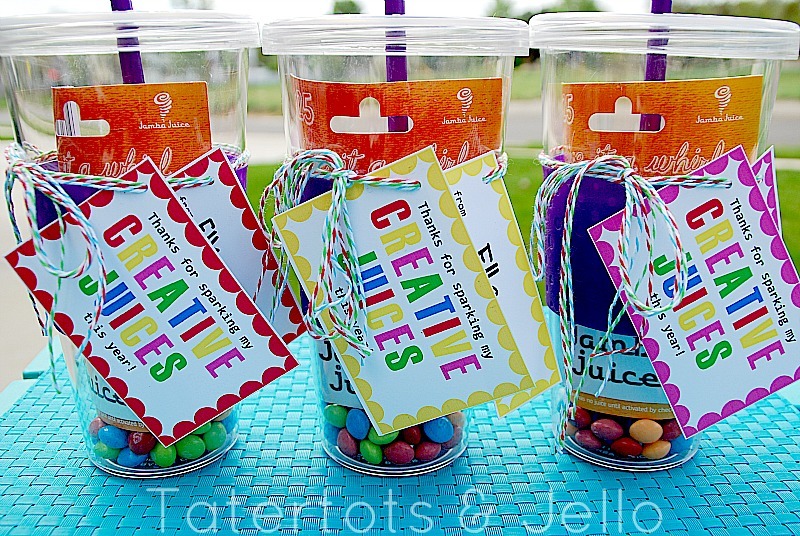 Hi :) I'm trying to print these super cute "creative juices" tags, but the link isn't working? Sorry the link has been fixed. Hi! 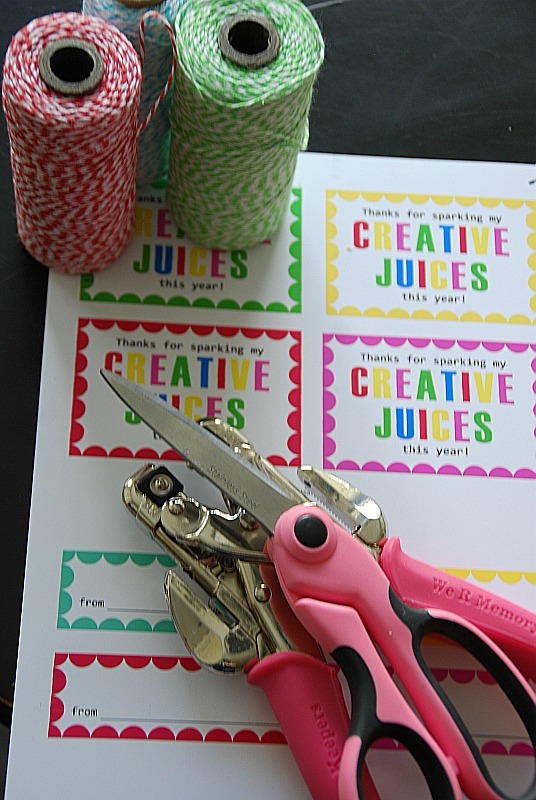 I am trying to print these adorable "creative juices" tags but the link isn't working? The link has been fixed sorry for the delay. How can I change it to read our instead of my creative juices? We want to give it to teacher from the class. What a bright, fun idea! What a fun idea. I had to create these labels and use the whole idea for my teacher gifts this year!! Love! Hi! What a great idea! I was curious where you get your bulk bakers twine? Thanks for sharing! Sears has those Copco tumblers on sale today for $5.99. I just picked up 4. Thanks for the awesome idea! and the free printable! I used this for both my children's teachers. 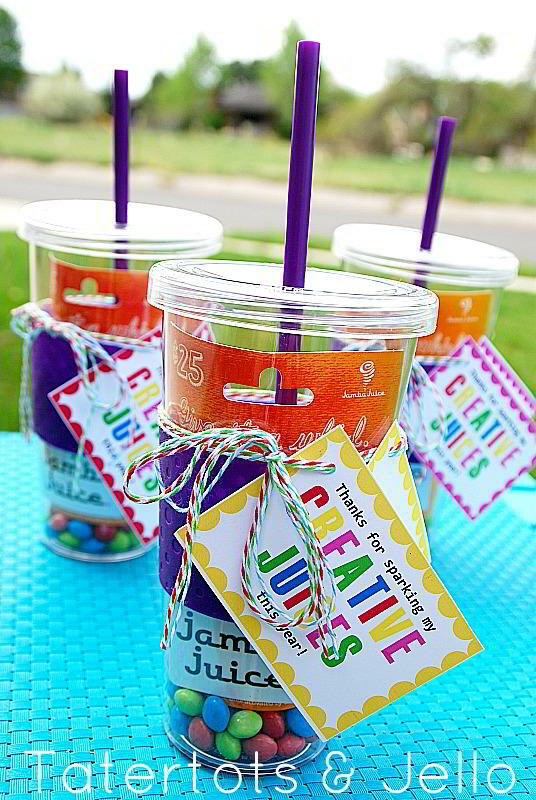 We don't have a Jamba juice near us but I purchased a can of Jamba Juice and put it inside each cup with the skittles- very cute! Thanks a bunch for sharing! So cute! I just bought sonic gift cards for the teachers and this will be a great way to give them! Thanks for sharing this cute saying! 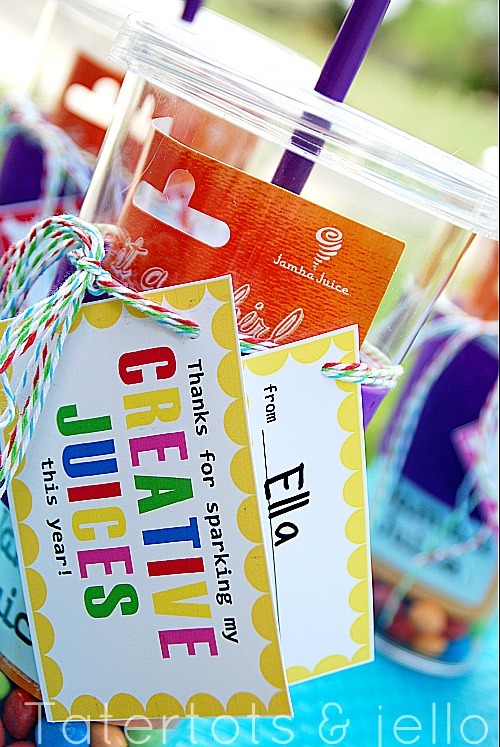 Jamba Juice gave us a great price for Jamba's for all our teachers and staff that will be delivered tomorrow! I just cut and hole punched 50 of these! Great timing!!! If you don't want to do a gift card, another option is loading it with the single-serve juice packets like Crystal Lite. You can buy them at the same place as the cups. Thanks for sharing the printable label! I am not good with stuff like that! For those looking for these tumblers - I've also seen them in Big Lots, Walgreens, Dollar General Store and even Kroger! The prices range from $2 to $10. Love this idea but we don't have a juice place nearby. I am going to use a Target gift card in the cup and substitute "Thanks for keeping me on Target this year!". Thanks for the inspiration. Simple and cute idea! I love the saying. I also like giving teacher's a gift card so they can go do something fun for themselves after giving so much. Thanks for sharing! These are very pretty and what a clever idea! I think they were $1.99/each. Thanks so so much! This is perfect! Thanks for letting me stop by Cindy!! It's been so fun!! 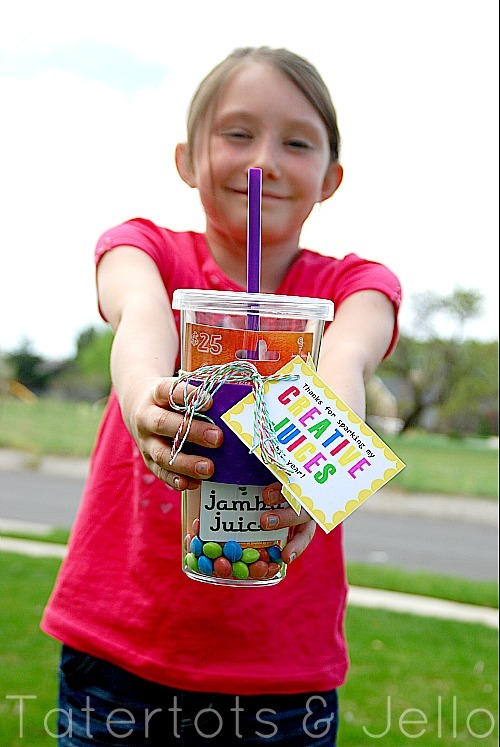 I don't think we have any Jamba Juice's near us, but I could sub in a Michael's or JoAnn's GC! Thanks! But where did you get those cups and what kind are they? Thanks!! This is such a colorful gift!